And we even published a detailed article onhow to pitch stocks. As an added bonus, there was an exceptional interview with one reader on oil & gas modeling case studies and stock pitches, where he explained how he moved from a large bank to a top energy fund. Just one problem: I couldn’t share any of the models or documents back then. I’m going to share with you a complex NAV model for an oil & gas company, plus a detailed 20-page stock pitch that were “inspired” by that previous interview. Even if you sign up for every single in-person oil & gas training program and buy every single oil & gas book on Amazon.com, you will not be able to find anything like this. Keep reading, though, and it’s yours for free. You’ll also learn why even a well-researched and extremely in-depth stock pitch can be completely wrong and what to do when that happens. WARNING: This is an advanced-level model. If you’re a beginner, you will be lost. If you feel comfortable with models of this complexity, this is a great template. We take a critical look at Ultra Petroleum [UPL], a US-based oil & gas company in the exploration & production (E&P) sector, in this recommendation. It is not a huge company – at the time of the pitch, it had around 3.1 Tcfe of Proved Reserves, 257 Bcfe of annual production, and $800 million in annual revenue. Just before I researched and wrote this pitch, the company had announced a $650 million acquisition of acreage in Utah, primarily for cash flow purposes. Gas prices had fallen a lot in the few years before this, while oil prices remained high – and the new reserves were 100% oil. The company claims to be the leading “low-cost” producer in North America. That may or may not be true… but does it matter? How much of a difference do lower CapEx and operating costs make on its implied valuation? At the time, there was significant risk that its drilling activities in the Marcellus Shale of Pennsylvania might be halted or significantly reduced, since they had JV partners in the region that were not inclined to continue. Does that matter? If so, by how much? And then there were other fun bits – for example, the company’s reserve numbers did not add up if you scrutinized them in-depth. 2) Not providing enough detailed information to sum up EUR per Well in Region 1 * # Wells in Region 1 + EUR per Well in Region 2 * # Wells in Region 2 (and so on) to actually match their disclosed reserve numbers. You can research these points by reading investor presentations, annual and interim reports, and commentary online. Before diving into a complex Excel model like the one here, you really need to think about potential reasons why the stock may be mis-priced, catalysts, and risk factors first. Otherwise, you might spend a week on a complicated model and then find that it’s not a great company to pitch in the first place. Spend 2 days researching companies in your sector. Look for ones that are undergoing an operational change, making an acquisition, expanding into a new region, or doing something else that may impact the valuation. Once you’ve found the best candidate, start the Excel work and make sure your model supports your investment thesis. This might take 3-4 days (with simpler Excel work). Then, spend the remaining time (1-2 days) writing your pitch or drafting a PowerPoint presentation. With this UPL pitch, you know in advance that your model has to support an acquisition, sensitivities around expense assumptions, different drilling schedules, and sensitivities for the average EUR per well. If you have those end goals in mind before you even start the Excel work and presentation, your life will be much easier – and you can figure out all of this by doing 30 minutes of reading. For E&P companies, the Net Asset Value (NAV) model is by far the most important methodology, so we skip full comparable company analysis and precedent transactions. We’re also skipping them because they wouldn’t be as accurate due to the company’s recent acquisition. The NAV model linked to above may seem intimidating, but the underlying idea is not that complicated. First, you split the company into its Proved Developed (PD) Reserves and its Proved Undeveloped (PUD), Probable (PROB), and Possible (POSS) Reserves. You do that because the PD Reserves are already producing, or can start producing relatively quickly, while the others require more CapEx spending and development time first. You also do it because you rarely have granular data on the PD Reserves. Assume a Decline Rate for PDP (Proved Developed Producing) Production – This is based on historical decline rates, outside research, and the company’s R/P Ratio. Eventually this production will hit 0, but before it does, we calculate revenue, expenses, and cash flow associated with this existing production and discount and sum up everything. Assume a Later “Start” to PDNP (Proved Developed Non-Producing) Production – This starts in Year 2, and then also declines and runs out just like PDP production. 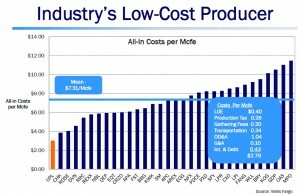 PUD / PROB / POSS Production – For these, we divide it into regions (Wyoming and Pennsylvania are the main ones), project a certain # of wells drilled each year, assume CapEx spending associated with drilling each well (the “D&C Costs,” or “Drilling & Completion Costs”), and then assume that production eventually declines to 0 for each new well drilled… and then discount and sum up revenue, expenses, and cash flow for each region. We apply different risking to production from each reserve type since PUD Reserves are more certain than PROB Reserves, which in turn are more certain than POSS Reserves. Factor in the Utah Acquisition – The idea is similar, but we have PDP / PDNP Production and PUD / PROB / POSS production all on the same spreadsheet since it’s new territory and not yet included in the existing production and reserves figures. Add Everything Together and Calculate Implied NAV per Share – At the end (see cells B70:K102 in the “Assumptions” spreadsheet of the model), you sum up the NAV for each region / reserve type and calculate the total at different long-term gas prices. For an oil-dominant company, you would use oil prices instead. Run Sensitivities – So, what does the company look like if LOE (Lease Operating Expenses, sort of like Operating Expenses for a normal company) fall by 20%? What if the average EUR per well is 20% lower or higher than anticipated? What if CapEx spending is also lower or higher than expected? 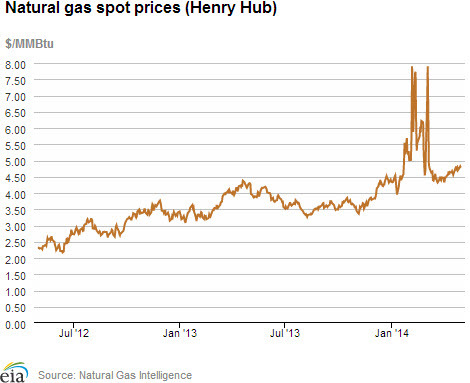 How does the value change at different long-term gas prices? We cover this model across 15 hours of video (~200,000 words of explanation) in the Oil & Gas Modeling course, so this is a very high-level summary. Next, you need to use these numbers to make a decision. Sometimes, you get lucky and the company is clearly overvalued or undervalued. At gas prices at that time, the company would have been valued about appropriately – so we move into the next step: sensitizing the assumptions we are most uncertain of. We could look at 5,233 different assumptions here, but the one we’re most uncertain of is the EUR per well since the company gave contradictory information on those figures. Figures for the D&C costs per well, LOE per well, and IP (Initial Production) Rate per well are much more “set” because a ton of historical data backs those up. Of course, you should also look at the other assumptions and see if being wrong on one of those will push up the valuation (they don’t make a big difference here). Here, the company looks overvalued based on the EUR per well sensitivity, so we lean toward a “Short” recommendation. Once you have enough data to lean in one direction or the other, you move to the next step and link the catalysts you found to this output. In this case, we’re looking for catalysts that might push down the company’s stock price and that we can tie to specific dollar amounts in the model. Acquisitions – The close of the $650 million Utah acreage acquisition. Reserve Reports – The release of new reports from the existing territories (since we believe the reserves are overstated there). Produce / No Produce Decisions – The potential halt to drilling in the Marcellus Shale. You can read for yourself how we make the case that each of these catalysts could push down the company’s implied value. We estimate the per share impact for each catalyst under different long-term commodity price cases. We show the evidence for why each catalyst is plausible (see the top of page 7 of this pitch for an example showing how the reserve numbers don’t add up). At the end, we also point out that even if none of these catalysts pans out, the company is valued appropriately right now… so we shouldn’t lose money (theoretically). Once you’ve explained the catalysts, you give the top risk factors and explain how you might mitigate them. What if the $650 million acquisition fails to close? What if we’re wrong about the EUR per well, and drilling reports continue to be positive? What if drilling in Pennsylvania continues as planned? You can go beyond these risk factors by digging into the company’s filings. One example for UPL: the company was working on improved well spacing at this point in time. So instead of drilling 1 well every 50 acres and getting, say, 5 Bcfe of reserves from it, the company might be able to drill 1 well per 10 acres of land instead. They would get less than 5 Bcfe per well by doing that, but they wouldn’t necessarily get 80% less. So if the EUR per well drops to only 2 Bcfe rather than 1 Bcfe, the effective reserves would increase. In fact, something even worse than the “worst case scenario” happened here because the company’s stock price has increased by over 50%, and closed at $30.01 as of the time I’m writing this. Rather than staying in the $3.50 – $5.00 range, as everyone predicted, natural gas prices instead spiked to close to $8.00, off and on, in the first few (cold) months of the year. No one can predict exactly how commodity prices will change over time, but they are a huge risk for any energy stock (we didn’t list them as a catalyst or risk factor since they affect all energy companies). It was also not the best idea to make a “Short” recommendation for a natural gas stock heading into the winter in North America, Asia, and Europe – gas prices tend to increase whenever winter is coming. It beat consensus EPS estimates… twice. And it even beat revenue consensus estimates in one quarter because of oil production from the Utah acquisition. Several equity research analysts upgraded their price targets and ratings. Technically that shouldn’t matter, but the stock market is not logical. Stocks that have plummeted will often see a rebound at some point because… enough is enough? As with most “Short” recommendations, timing is essential. For more on why that matters so much, check out this excellent “Short” pitch for Conn’s. Here, we still believe that UPL is overvalued and is even more overvalued now – but that can be completely irrelevant if you get the timing wrong (see: the long-term chart for Conn’s). We knew about many of these risks in advance, which is why the pitch recommended a buy-stop order in the $23.00 – $24.00 per share range. We still would have lost ~25%, but that’s much “less bad” than losing 50%+. This article, the model and stock pitch, and the video tutorial above are already more detailed than most paid training programs on the market. If you want more, there’s now a set of 41 lessons on this model and stock pitch included in the BIWS Oil & Gas Modeling course (short outline and long-form course outline). If you’re interviewing for energy-related public markets roles (hedge funds, equity research, asset management, etc.) this new set of lessons will be very useful – and they’ll be even more useful if you’re about to start working in one of those groups. The course goes into more depth than typical case study exercises, but wouldn’t you rather be over-prepared? And before you ask: yes, similar stock pitch analyses are coming to the rest of the courses. The goal is to base every module of every course on an investment or acquisition recommendation (for buy-side roles), or advice to a company on M&A and financing options (for IB roles). and obviously, rely on comps analysis for valuation rather than a DCF (for downstream) or NAV (for E&P) model? I think the latter maybe more useful though you can come up with a *simple* model and present it to the interviewers. I don’t think its necessary to build a complex model. The key is to be able to present yourself well. Quick question. Compared to this NAV model, how detailed/advanced is the mdoeling in the Oil and Gas course? It’s the same exact model we cover in the course itself, but the course has step-by-step lessons for how to do everything, plus written guides (over 100 pages), transcripts, and quiz questions to test yourself at the end. Great article Brian, looking forward to the oil & gas course….funny I actually went long UPL at around $19 then bought more after the acquisition. During background checks, would my offer be rescinded if I said I did IB at a firm I interned at when I worked in ER? Seems this is useful for IB too or only for asset mgmt? It still applies to IB, but you normally don’t go into that level of detail in valuations… so it depends on the assignment. Hey Brian – thanks for more great content, awesome material! Quick question: where did you find the CONN pitch/who created it and where can I find more examples of good stock pitches? Thanks! I think I saw the CONN pitch in the comments of some random Seeking Alpha article, no idea who the original author was, but it was a great example so I saved it. You can find pitches on Seeking Alpha, but the quality varies widely and they don’t include in-depth models for the most part. You can also check http://www.valueinvestingcongress.com/ for occasional materials. The NAV model seems to be not working properly – half the cells are NA’s. Or is it supposed to be this way? I opened in a Mac originally and I got “N/A errors.” Then I tried using a PC and it worked properly. Maybe you have the same problem. Yeah I would try opening on a different computer and/or making sure circular references are enabled. I think the issue may be that IFERROR works differently in Mac versions of Excel. This is an amazing article and super helpful. Thanks a ton for doing this. I’ve already signed up for a few of the BIWS courses and have been eyeing the Oil & Gas modeling course for a few weeks as I think about how I want to position myself for the future. I’m pretty sure I’m gonna sign up soon. This stuff seems pretty cool.